We went to church a few weeks ago & someone there mentioned getting connected to the Lord God. That phrase made me think of an old telephone exchange, with an operator pulling those cables out & plugging them into the appropriate hole to make the connection. I’ve drawn the cable connecting to God as a gold wire in my picture. As an idea it is quite right that we all need to get connected to the Lord. But this particular metaphor falls down when you start to think about it. In the early days of telephones the caller had to go through someone else at the exchange (the operator) in order to get connected at all. And that idea reflects what the Old Testament was all about, with the Hebrew people not wanting to connect directly with the Lord, but using the High Priest to do that for them. He went into the temple & the Holy of Holies once per year, to make atonement for his sins & the sins of the who Hebrew nation. Maybe I should have drawn the telephone lady as the High Priest in my drawing?! Fortunately for us, & since Jesus’ substitutionary death on the cross, we don’t need anyone to represent us (a high priest) or to make atonement for us & our wrong doing. Jesus has paid the price for all of our sins, & so we do not need an operator to get connected to God. Jesus enables us to make the “call” directly ourselves. 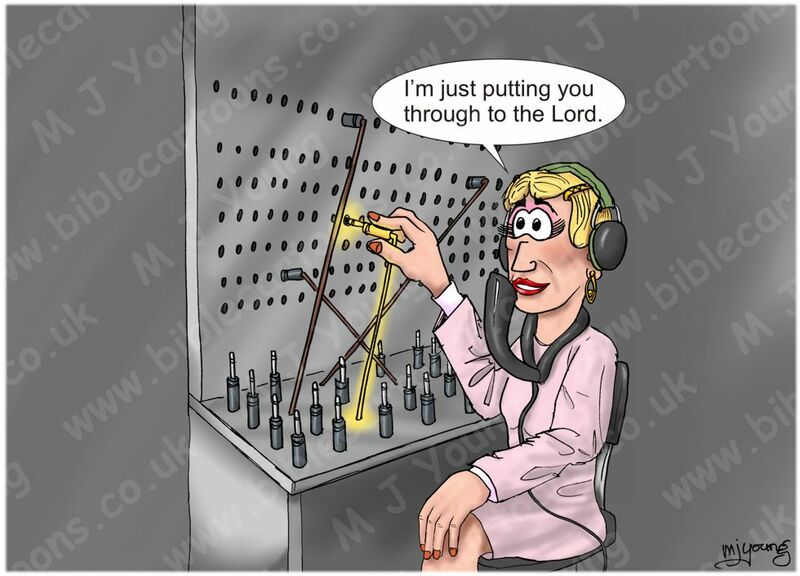 I suppose I could have shown Jesus as our operator then, to be strictly accurate!